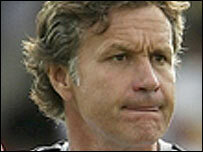 Newcastle have terminated the contract of assistant manager Kevin Bond. Bond was placed on gardening leave after a BBC Panorama programme secretly recorded him saying he would consider receiving payments from an agent. Bond, then at Portsmouth, says he has never been interested in receiving bungs and will fight to clear his name. He said in a statement: "I am extremely disappointed Newcastle have terminated my contract without any proper investigation into the allegations." The 49-year-old added: "My lawyers will shortly be going to court to compel the BBC to release full transcripts of the recordings. "Rather than waiting for this and the outcome of any Football Association investigation, Newcastle have made their decision solely on the basis of a few sentences carefully selected and edited by Panorama. "I intend to pursue all legal avenues to vindicate my reputation and restore my career and livelihood." Newcastle made public their decision in a statement to the Stock Exchange, saying: "Newcastle United have terminated Kevin Bond's contract. There is no further comment from the club." Bond ended his long association with Harry Redknapp in July by leaving Portsmouth to become Glenn Roeder's number two at Newcastle. Now reports suggest Lee Clark could be promoted to work alongside Roeder. Bond enjoyed playing spells at Norwich, Manchester City, Southampton and Bournemouth before beginning his coaching career in 1997 as manager of Stafford Rangers. He arrived at Portsmouth the following year as assistant to Alan Ball but was sacked in 1999 - only days after Ball was also dismissed. But he returned to the club in 2002, this time under Harry Redknapp, and helped the club win promotion to the top flight in 2003.